MOUNT AIRY, N.C. -- When actress Betty Lynn first moved to Andy Griffith's quaint hometown and inspiration for the eponymous show, she couldn't go to the grocery store without meeting enthusiastic fans, calling out to "Thelma Lou." "They'd hug me and kiss me," says the actress, who played Deputy Barney Fife's girlfriend on the hit television show. "Some of them cry." Actress Betty Lynn kisses the cheek of 9-year-old Steven Capin at the Andy Griffith Museum in Mount Airy, N.C. Eight years later, Lynn is "just another local," says Terri Forrest Champney, a volunteer at the Andy Griffith Museum. "She's just one of us." Except for every third Friday of the month, when the 88-year-old actress transforms from a local to a legend. On a recent sweltering afternoon, the line snakes out the door as an attendant rolls Lynn's wheelchair up to a small table festooned with pink-and-orange flowers, black Sharpie markers for autographs and a white sign that reads: "Mayberry Star - Betty Lynn." Across the room, a mannequin is dressed in the U.S.O. uniform Lynn wore when she entertained troops in Asia during World War II. As she sips her Coke through a bendy straw, a television plays clips of the redheaded star's younger self on a loop. Tourists wait, sometimes for hours, to lean in for a hug and, if they're lucky, a kiss. "I won't wash my cheek," gushes Roger Reckling, who drove with wife Esther from their home in Lake Wylie, South Carolina, to meet the star. While plenty of youngsters marvel at the memorabilia, it's the older folk who wax nostalgic about a show they've loved for decades. The Recklings record reruns and "we watch 'em practically every day," says Esther. 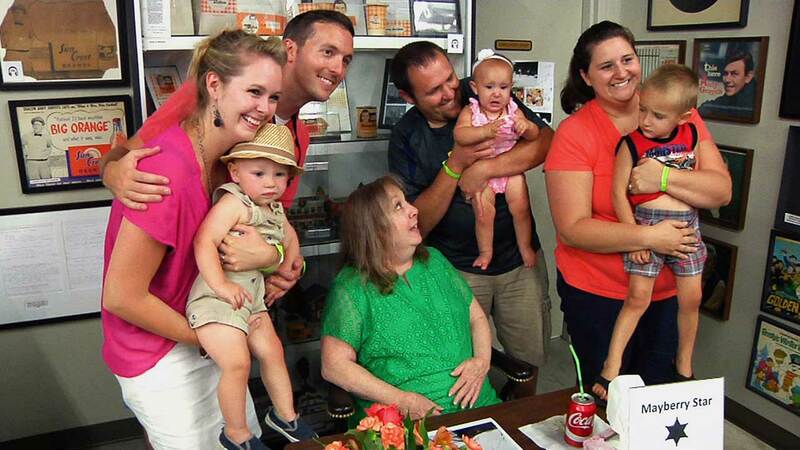 Actress Betty Lynn is wheeled into a room of adoring fans at the Andy Griffith Museum in Mount Airy, N.C., on Friday, July 17, 2015. Lynn has been living in Mount Airy - a former textile town nestled in the foothills of the Blue Ridge Mountains - since 2007. She made the move after her Hollywood home was broken into twice while she was away on appearances. Too afraid to move back in, she checked into a hotel and weighed her options. Lynn says she considered her hometown, Kansas City, Missouri, but didn't want to deal with the weather there. She'd been coming to Mount Airy's Mayberry Days celebration for years, and said it seemed nice and safe. Soon after she arrived, someone stole her wallet outside a grocery store. She laughs just thinking of the irony. But aside from that one little bump, Mount Airy has been the bee's knees, says Lynn. In this July 17, 2015, photo, actress Betty Lynn waves to the line of fans waiting for her autograph at the Andy Griffith Museum in Mount Airy, N.C.
"I think God's blessed me," she says. "He brought me to a sweet town, wonderful people, and just said, 'Now, that's for you Betty.'" When asked to explain the throng's obvious adoration, Lynn demurs: "It's that show. It's not me. I mean, I know that." Her admirers whistle a different tune. "She really wants to know the fans," says Allan Newsome, who runs the website for the show's Rerun Watchers' Club and moonlights as Floyd the Barber during Mayberry events. "They know her from 'The Andy Griffith Show' and, to meet her in person and to realize she is just about as sweet as Thelma Lou was on TV, she's really had a big impact on them." Lynn appeared in just 25 episodes, but her character has had an outsized impact on the fan base. Indianapolis resident Paula Nigh and her 16-year-old daughter Lily planned their drive to Lily's North Carolina summer camp around meeting Betty Lynn. "We've just admired her, admired her character," says Paula Nigh, as they stood in line. "She just seems like a sweet, wonderful person." Lynn is one of fans' last living connections to the show. Griffith died in 2012 and Don Knotts passed in 2006. Actress Betty Lynn signs a photo of her character, Thelma Lou, kissing "Deputy Barney Fife" played by actor Don Knotts, during her autograph event at the Andy Griffith Museum. "People say, 'What was Don Knotts really like?' Nothing like Barney Fife at all, that's for sure," Lynn says. "He was a very quiet man, very sweet. I miss Andy and I miss Don." "She was so mean," Lynn says with a giggle of fellow ginger, Dallas Bryce Howard. The signing is only supposed to last three hours. But when quitting time arrives, the line still winds around the room's Mayberry mementos, many from Griffith's personal collection. Even though she's tired, Lynn smiles and pushes ahead for two more hours. No one leaves without a chance to say hello. When the last photo is autographed, Lynn straightens her green dress and picks up her flowers. With a satisfied sigh, she takes in the empty museum - the only noise, a stereo playing the show's iconic whistled theme song. "Do you hear that?" she says. She smiles as an attendant wheels her outside for the short ride home.